The multi award-winning film will premiere in select cities including Chicago, San Antonio and New Braunfels, Texas, Holland, Mich., and Washington D.C. Return to the Hiding Place stars John Rhys-Davies (Indiana Jones, Lord of the Rings), Craig Robert Young (“NCIS: LA,” “Hawaii Five-O”), David Thomas Jenkins (“CSI:Miami,” “Bold and the Beautiful”), Rachel Spencer Hewitt (Fly by Night, A Civil War Christmas) and Mimi Sagadin (The Dilemma), and features a stellar crew that includes the Director/Producer father-daughter team of Peter C. Spencer and Petra Spencer Pearce. Josiah Spencer serves as film editor with Jeff Canavan as co-producer. 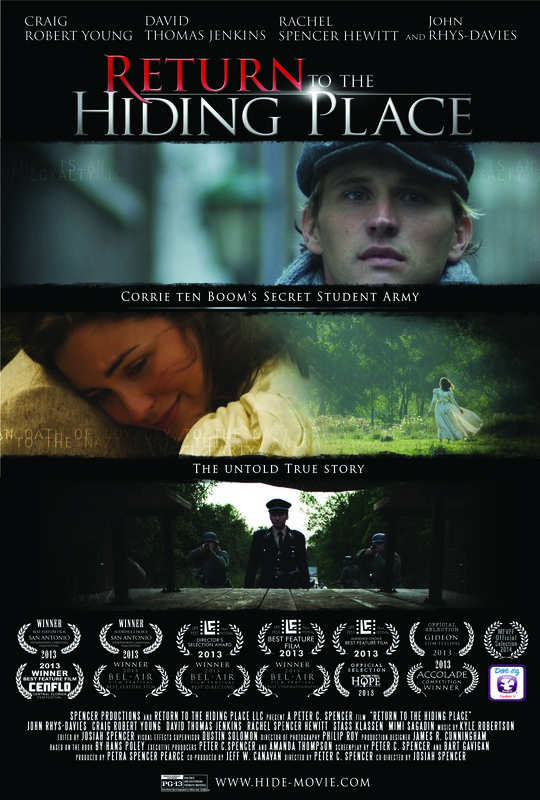 Highlighting themes of endurance, perseverance and faith with positive values and moving action sequences, Return to the Hiding Place is based on the true story taken from the autobiographical book of the same name written by Hans Poley that recounts his experiences as a student resistance fighter during the Holocaust in World War II. Set in Holland, the movie follows the exploits of an army of untrained teenagers living in hiding at Corrie Ten Boom’s home, who face deadly challenges in the Resistance as they rescue Dutch Jews from the Holocaust. Peter Spencer has won numerous national awards for writing, producing and directing, including his TV series, “Heroes of the Faith,” shown on over 2,000 stations worldwide. Peter wrote and orated Holy Art in a piece by award-winning international media-artist Christian Jankowsky, which has been exhibited at the Whitney Museum in New York and other museums and galleries throughout the Berlin, Paris and 21 major European capitals. Spencer has garnered praise from the New York Times, Washington Post, and L.A. Times for his communication style. His interviews with his mentor, Hans Poley led him to research the Dutch Archives, life histories and survivors of the Hiding Place and their friends. This created a world immersed in the realities of Holland in the 40’s, inspiring meticulous, and a realistic script for the multi festival award winning film, Return to the Hiding Place. Additionally, Peter’s most recent project in development is Thief, a drama, based on Spencer’s book of the same name, which chronicles the life-story of the actual thief/revolutionary who was crucified next to Christ.